"Mom needs a little space." 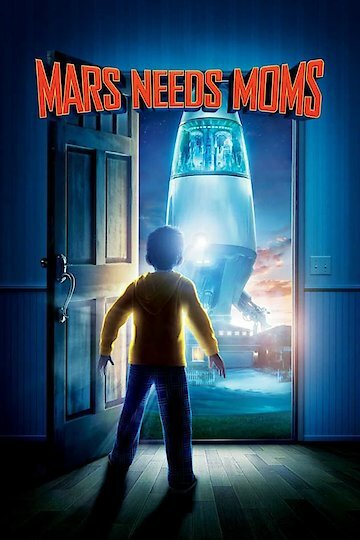 Mars Needs Moms is a movie about Milo. Milo is nine and lives with his two parents. His father works constantly and is away most of the time. His mother stays at home and takes care of him. Milo resents his mother and constantly rebels against her. After being grounded on his first night after summer break started, Milo wishes that he never had a mom to tell him what to do. He goes to apologize to her for saying such a mean thing but, the Martians are kidnapping her. He follows the Martians to their ship and stows away, planning to get his mom back. The Martians find him and lock him away in the jail. He is released by Gribble who has been hiding on Mars for years. Gribble lives underneath the Martians complex. Milo learns that the females run the planet and the supervisor is their leader. The male children are sent down the garbage chute to be raised by the other males of the planet. Milo convinces Gribble to help him save his mom before it is too late. While Milo is trying to save his mom, both him and Gribble are almost caught by the supervisor. Milo is helped by a girl name Ki but gets separated from her. He finds Gribble and they escape to the old Martian city. While in the Martian ruins, Gribble tells Milo about how he got there. Gribble has been on Mars for around twenty years because he could not save his mom in time. Ki arrives, having followed Milo and Gribble. Together they discover an old Martian painting that shows that once Mars had the same family structure as the families do on Earth. They then race against the clock to try to save Milo’s mom before the sun rises and she disappears forever. The three also save the Martians from the supervisor in the process. More Like Mars Needs Moms! Mars Needs Moms! is currently available to watch and stream, download, buy on demand at Starz, Amazon, Vudu, Google Play, iTunes, YouTube VOD online.